This was indeed a good one. I threw away the ones where the flower head was blowing so hard that it cut the frame or ended up out of focus. It was an amazing cemetery. Simple in composition, saturated in colors. I believe this is a new favorite for me. Wind is such a challenge, and WOW on that background! Happy new favorite! The wildflowers in the background lent their rich colors without any details. Quite beautiful, Steve. I appreciate these suggestions from the field for handling difficult conditions. The grand result speaks for itself. I’m pleased you consider the result grand and am glad you found the suggestions valuable. With closeups I spend a fair amount of time down low or even lying on the ground. The wind here made my life hard but high shutter speeds and relatively high ISOs did the trick. Goodness, a beautiful shot. I have a feeling I’m gonna say that very often on this site. Thanks. I’ve been promoting native plants in the Austin area for almost eight years, with occasional jaunts to places farther away in Texas, in other states, and even twice each to Canada and New Zealand. Central Texas is home to such profuse wildflowers, especially in the spring, that I can count on beautiful views. As you say, simple in composition (although not simple to get!) and richly saturated in color. Saturation can saturate my mind as much as it want to. I’be been reading about the poor folks who are seeing the worst flooding ever in Iowa….I’ll bet they’d rather be saturated with color! Yes, they’ve had a terrible time. Even under normal conditions this would be much too early in the year for places that far north to have flowers. Ten years ago in the spring we drove from Austin to Iowa to attend a wedding. When we left Austin everything was warm and green and flowering. As we drove north, the spring gradually receded, and by the time we reached Iowa there wasn’t yet a green leaf on any tree or a flower to be seen anywhere. That reminds me of the naturalist and his wife who drove north with the spring and wrote a book about it. Can’t remember his name to save my life. What a beauty. Flower and shot. 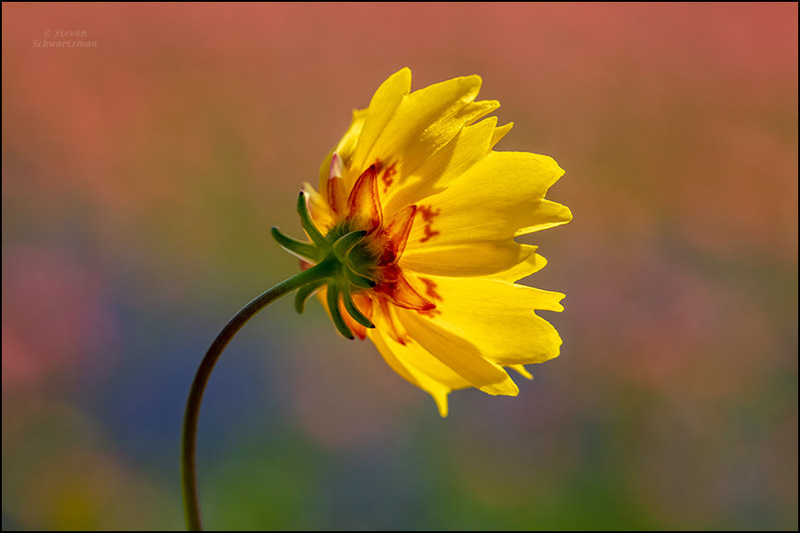 The Nueces coreopsis (named for the Nueces River) is especially nice due to its red markings about a third of the way out from the flower head’s center. Haha, I’d actually meant this for the Texas wildflowers post, though this one is certainly phantasmafloragorical in its own singular way. Indian paintbrush or something like it supposedly lives here, but I seriously do not remember seeing it. It is one of those mythical flowers that I have heard of in exotic places, so if I never see it, that would be just fine. Let’s hope you do eventually get to see one, even if not in the numbers we have here. South of Gonzales on FM 108, I found exactly one of these flowers. It was along the side of the road, and caught my eye because of those beautiful red markings. I’d never seen anything like it, and I had no idea what it was. Now I do. It looks like you had some nice sunlight to go with that wind, and the photo captures the sense of liveliness I felt in them. It surprises me that you found only one. Beginning south of Seguin I found scads of them, as I expected to from earlier trips down that way. The patterning on each head is attractive, no doubt about it. The sunlight made this picture possible. Otherwise the light would have been too dull to use a high shutter speed. Lovely windswept blossom and background, Steve. I’m pleased with this artistically. Glad you are too. That background is extraordinary! I love the blowing Coreopsis too, of course – it’s great to use a different angle – but oh, the way those background colors merge together and complement the flower! Fabulous image! I’m sorry to have to leave so many comments at once – I just can’t keep up these days! Thanks, Lynn. I was really happy with the background: all color and no detail at all, a portrait photographer’s delight. No problem about a bunch of comments at once. As with setting a camera, sometimes bunch mode is what’s called for.